Hudon, Jocelyn and Lorraine G. D'agincourt. "Jay". The Canadian Encyclopedia, 31 July 2018, Historica Canada. https://www.thecanadianencyclopedia.ca/en/article/jay. Accessed 20 April 2019. 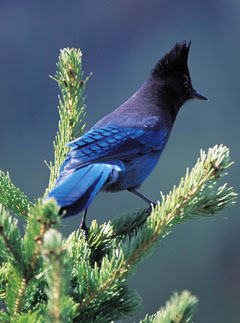 Canada is home to three species of jay: the blue jay, Steller’s jay and grey jay. The blue jay is practically omnivorous, feeding on various fruits, insects and grains, but also on the eggs or young of other birds (Corel Professional Photos). 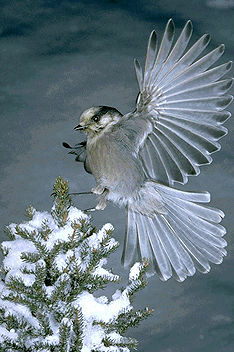 The plumage of the grey jay is loose and fluffy (Corel Professional Photos). Sound of the grey jay (press the Sound button) courtesy Monty Brigham, Bird Sounds of Canada. Steller's jay lives primarily in the West, in pine stands and coniferous forests (photo by Brian M. Walitski). The jay is a medium-sized bird of the crow family (Corvidae). Many jays have crests and are brightly coloured, often with blue overtones, and can be very vocal. Some 42 species are recognized worldwide, three of which live in Canada: blue jay (Cyanocitta cristata), Steller's jay (C. stelleri) and grey jay (Perisoreus canadensis). 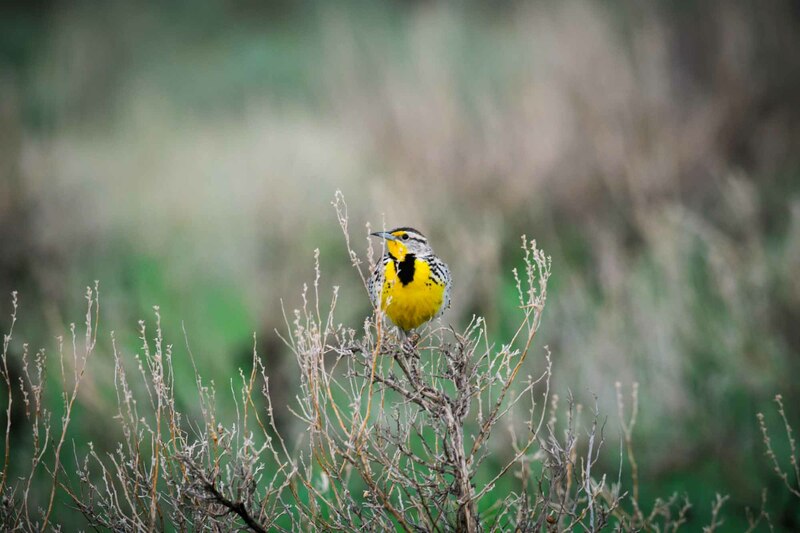 All are mainly permanent residents. Grey jays — sometimes called whisky-jacks or Canada jays — breed from the northern Yukon to Newfoundland, but are generally absent from southeastern Alberta, southern Saskatchewan and southwestern Manitoba. 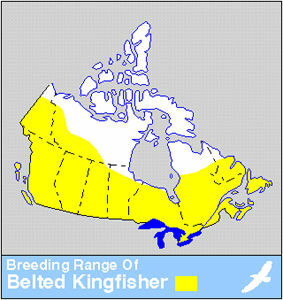 Blue jays breed in the central prairie provinces, southward and eastward across Ontario to Newfoundland. Steller's jays are restricted to western and southeastern British Columbia and southwestern Alberta. 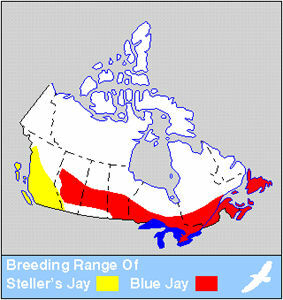 Hybrids between blue jay and Steller's jay have resulted from the blue jay's recent range expansion westward into BC. 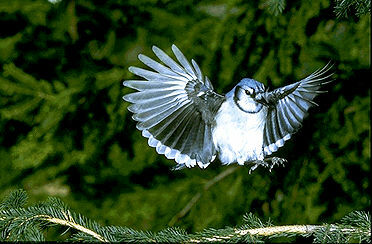 Essentially, jays are woodland birds of coniferous, mixed and deciduous forests. Blue jays are also very common in shade trees in urban areas. Jays are omnivorous, feeding on arthropods, various fruits and berries, nuts and small vertebrates, and are noted for storing food in crevices in trees and on the ground, which they may try to conceal. Scientists speculate that this behaviour may be a means of ensuring a constant food reserve throughout the year. To do this, jays are assisted by a particularly acute spatial memory. In addition, grey jays use their sticky saliva to attach food to tree branches, returning to it later on. 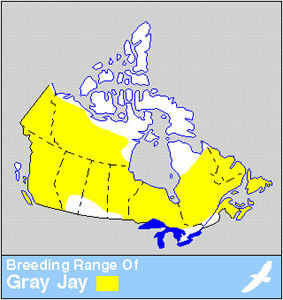 Jays tend to nest in conifers and lay two to six eggs at a time, and breed during the summer months. Blue JayHinterland Who's Who profile of the Blue Jay.